London, United Kingdom (May 10, 2017) – Harkness Screens the world’s leading screen technology company and thought-leaders in presentation quality has announced the forthcoming release of its animated sequel starring its storytelling characters, the Harklets. 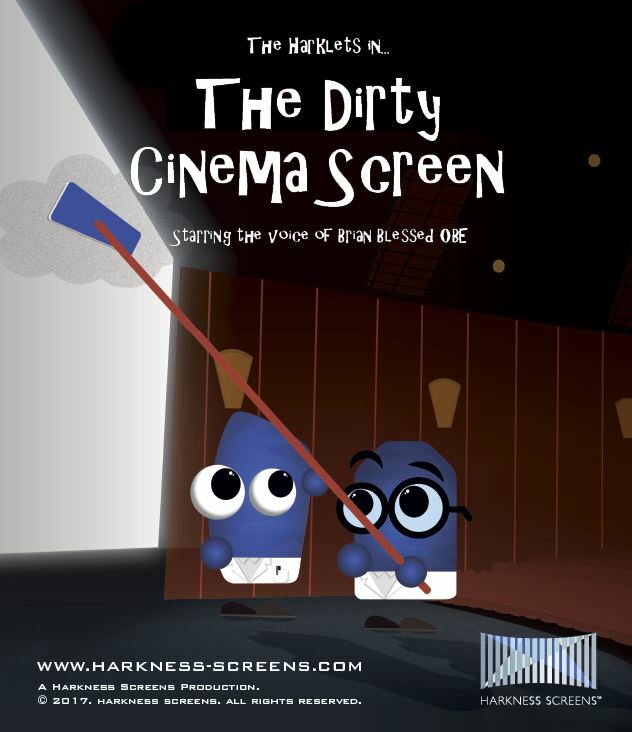 Designed to help educate and inform the movie industry in a simple and fun way, the Harklets return at CineEurope 2017 in their second animated adventure tackling a dirty screen in need or urgent attention. ‘The Harklets in The Dirty Cinema Screen’ is a short, fully animated adventure following on from the 2016 adventure ‘The Harklets in Reality Capture for Cinema’ and sees the return of legendary British actor and explorer Brian Blessed OBE as the voice over. Famed for his big booming voice and personality, he is most remembered for his iconic roles including Prince Vultan in 1980s cult movie Flash Gordon, as the voice of Boss Nass in Star Wars: The Phantom Menace and in countless Shakespearean productions on both stage and film. “After the success of the first adventure last year, we’re delighted to bring the brilliance of Brian Blessed OBE and our quirky blue friends back to the movie industry and premiere the new story at CineEurope, says Richard Mitchell,” VP Global Marketing at Harkness Screens. “Right now cinema exhibitors are focused on utilizing capital to improve the movie-going experience primarily through the implementation of reclining seating and lobby experiences rather than through technology upgrades to the auditorium. During this period it’s important that exhibitors don’t lose sight of the requirement to provide an excellent movie presentation experience and the importance of a well performing screen,” he adds. The short will receive its world premiere at the International Cinema Technology Association seminar at CineEurope, ‘The Harklets in The Dirty Cinema Screen’ will be found online across various video sharing sites including YouTube from June 19th 2017. “Through the new Harklets movie, we’re able to highlight the types of screen damage that affect presentation quality and require a screen replacement whilst at the same time showing the industry how, with minimal financial outlay and particular care, an existing screen that may be coming towards the end of its useful life might be preserved for a little longer until exhibitors are able to go back and retrofit the auditorium with next generation sight and sound equipment,” Mitchell adds.